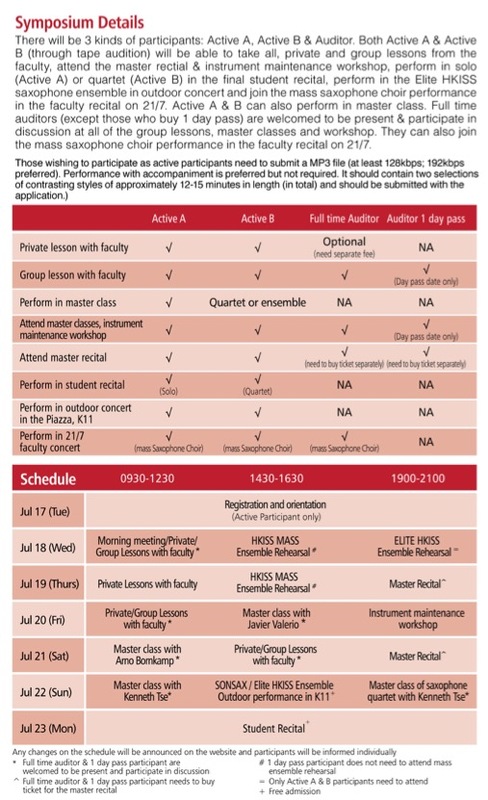 The Hong Kong International Saxophone Symposium is a gathering of professionals, amateurs, students, and enthusiasts who would like to learn more about saxophone performance, pedagogy, and other aspects. The format of the symposium would be one that includes lessons for the active participants and auditors, master class by each faculty, and concerts of various format. This will be a unique and intensive six day musical experience, offering students of all ages the opportunity to experience the highest level of musical growth on the saxophone. Apart from past activities, in HKISS 2018, there will be an outdoor performance in which more music lovers can have chance to appreciate the beauty of saxophone music.